Izabella's Tattered Letters: ~My dream house!!! One enters the Palace through a 5 foot wide 650 pound door which leads to a "Coat of Arms" that was imported from Italy and installed by crane because of it's over 1200 pound weight. 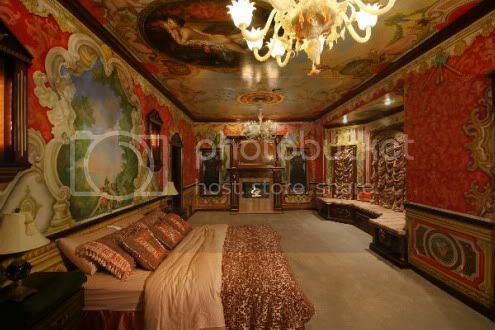 The outside walls are all over 1 foot thick which lead to the foyer of the 8 bedroom 9 bath Palace. The entry is divided by a 5 foot wide Italian marble staircase and an overhead walkway. A 600 pound crystal chandelier hangs overhead as do 12 other imported chandeliers throughout the property. There are 7 hand carved cherrywood fireplaces and most of the bathrrom fixtures are 22kt Gold plated. 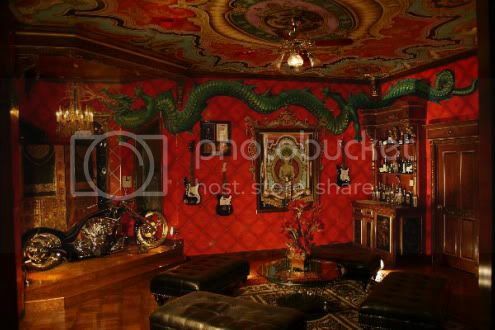 The hand painted murals on the ceilings took Master Artist Thomas Bisesti over 6 years to complete. 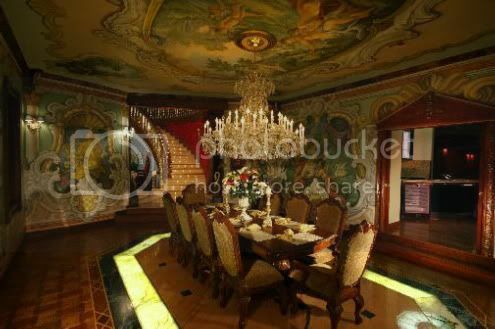 Which include an absolute masterpiece on the master bath ceiling above the enormous all marble jacuzzi. The bidet and european toilet are also built from all solid marble slabs. In 2004 entrepreneur/designer Nico Santucci purchased the palace and Contracted Thomas Bisesti to return to the property to restore his existing work as well as add new works on the North Wing to include the recently added proffessional Bowling Alley. 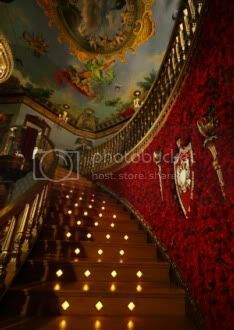 Not -withstanding a staircase wall covered in over 10,000 red roses Is another absolutely breathtaking addition to the the already awe-inspiring eclectic interior Santucci is known for. A complete tour of the palace takes over 60 minutes to simply absorb it's vast history and romance. OMG!!!!!!! This is WONDERFUL...FABULOUS!!!! and YES!!! I'll come to Las Vegas for the ART RETREAT!!!!! wow, i'd come visit!! Imagine all the art you could fill that place with!